Planning a funeral is something most of us will have to do at some point in our lives... but would you know where to begin? Would you know whether you are getting good value for your money? Do you know what is really needed and required by law? The loss of a loved one alone can be emotionally overwhelming and financially devastating, but the funeral planning doesn’t have to be a stressful or chaotic process. The FHP was created to give consumers a source of information from someone not trying to sell them something. We have devoted the past 15 years to assisting families in understanding the decisions required and their options at each step, via our toll-free line, email, seminars and public forums. We can help those needing assistance to find funds for funerals (though we do not have the funding to assist ourselves) and try to educate the consumer on all things funereal. Our software for arranging one’s own end-of-life affairs (Going In Style) helps tidy up all the ‘loose ends’ such as what is to happen to your plants? Your pets? Aunt Lucy’s pearls? 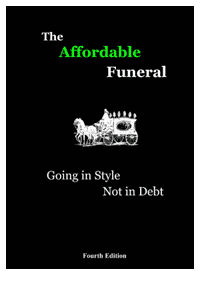 And our book, The Affordable Funeral, has been quoted in everything from Kiplinger’s to the Wall Street Journal. Come with us on a tour of the vital things that go into a funeral arrangement. When you’re done, please do share all you’ve learned with others. Copyright © FHP. All rights reserved.